Setting all emotion aside, and looking at them in the cold light of day, coupes don't seem to have much going for them. They provide none of the plus points of the saloon or hatch - space, practicality, an ability to get into the back while firmly grasping Mrs Shed's raspberry meringues - and none of the plus points of the sports car - light weight, agility, an ability to wind the roof back on a sunny day to bring out the bronze highlights in Mrs Shed's barnet. It would be unfair to claim that, when analysed objectively, the coupe comes out somewhere alongside the motorcycle sidecar or the Reliant Robin, or indeed slightly behind them on account of how it doesn't have their tax breaks. But there is some evidence to suggest that we are falling out of love with the coupe genre. Of the 10 slowest-selling cars on the US market in May this year, four - Infiniti Q60, F-Type Jaguar, BMW M6 and Audi TT - were coupes. Admittedly, four of the other six showroom-stickers were convertible versions of the same cars, ie Infiniti Q60, BMW 640, Jaguar F-Type V8 S and, er, Jaguar F-Type V6 S. But you take the point. While we're on points, the point about coupes of course is that they don't really have a point, other than to look stylish. That's an issue for today's car designers, compromised as they are by the need to create eight thousand variants from one multi-functional platform. For real coupe style, we need to look back in time (cue wobbly music and footage of fluttering calendar pages) to a time when designers weren't quite so hamstrung by the accountants, to a carefree age when they were allowed to create coupes just for the hell of it. 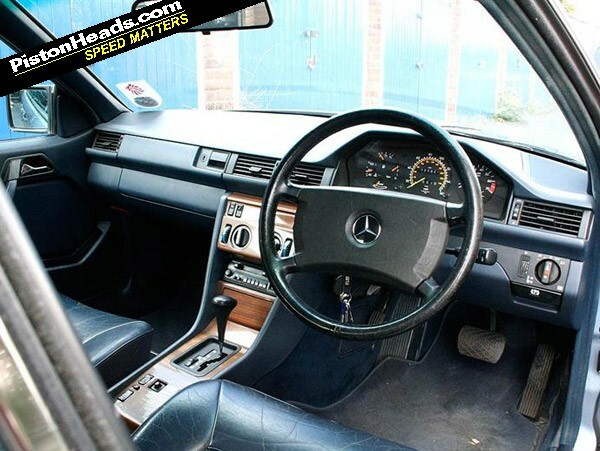 To the 1980s, in fact, and this week's Shed, the Mercedes-Benz 300CE. 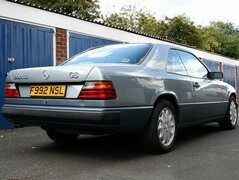 PH regulars and other lovers of fine motoring metal will know that this 1989 model comes from good stock. 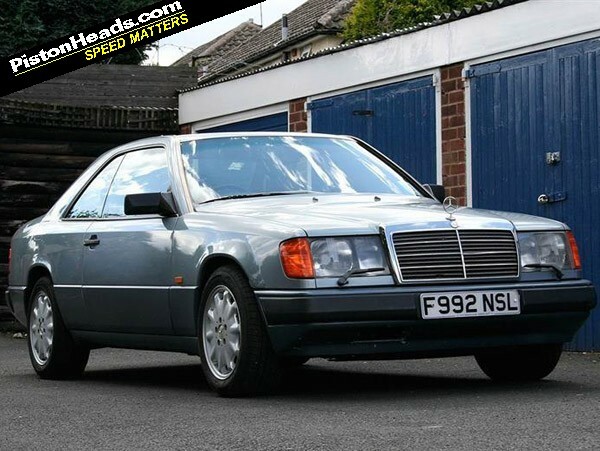 The W124 series is often referred to as 'the last real Mercedes', another truism that a qualitative comparison with today's cars might disprove. 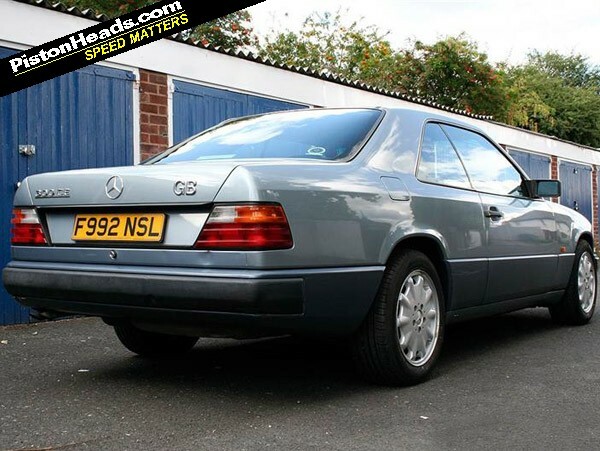 Nevertheless, along with the (also Bruno Sacco-designed) W201 190Es that occasionally feature in SOTW, the W124 saloons and estates were way ahead of just about everything else you could drive out of a mainstream dealership at that time in terms of solidity and passenger wellbeing. The CE had a four-inch shorter wheelbase and a one-inch shorter body than the saloon. It was no featherweight, but 185hp from the 12-valve 3.0 six was enough to schmooze you about town in a dignified manner, and it had a purity of line all of its own, aided to a great extent by the pillarless profile that looks sharp today. 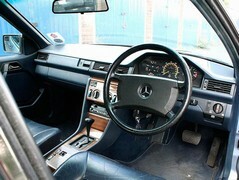 This 1989 car was from the last year of 12-valve 300CE production; the 300CE-24 replaced it in 1990. 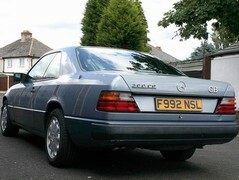 If you ever see an AMG 3.4 CE at sensible money, by the way, snap it up: they only built 25 of them. Judging by the thin scattering of buttons on the dash, this car was quite meanly specced by the first owner, but because it's a Merc that's no great hardship: you still get the string-vest seatback map pockets, the analogue clock that quite literally reminds you of better times, and M-B's unique zebrawood that grows to attention in order to rule out knots. 25 years old now means classic insurance? We can't really see the poor paint referred to in the ad, but there's nothing secret about the dent on the rear valance or the bubbly bits on the front nearside wing. The cost of painting the new wing that will be supplied with the car could be anything from £200 to £500, depending on who ends up doing it. Remember that price is not always a guarantee of quality. If you don't know anyone in the trade, look for someone who appears to be busy. It's not as if a wing is structural, so it makes perfect sense to tack yourself onto the end of a good man's waiting list. Then you've got something to look forward to, like Shed does when Mrs Shed makes her annual visit to her mother's in Kidwelly. 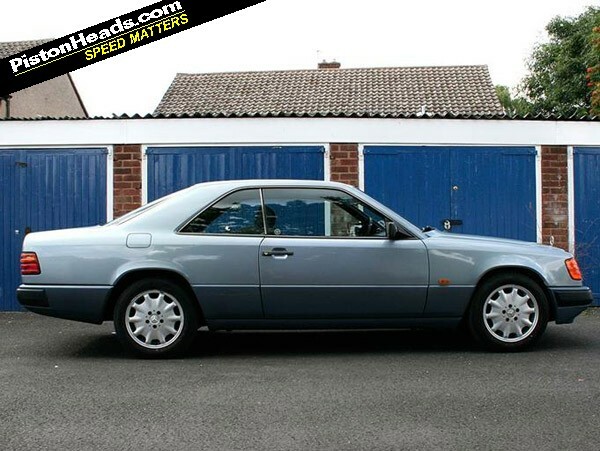 W124 sixes are strong cars even now, but they're not perfect. Watch out for traces of oil in the coolant (cracked cylinder heads aren't unknown); check that the ABS light goes out when it should; check the front screen frame for corrosion and the diff for leaks. This Shed is pretty low mileage, and cam timing is by chain, but you still need to look out for the usual weary-outy parts of an old car, like ARB bushes, steering, and tyres (uneven wear). All that said, Shed has a good feeling about this car and the owner. Small things, like the choice of Falken tyres, say a lot. For Shed, this shows a thoughtful owner who is unmoved by peer judgements or by the blandishments of advertising. Falkens are perfectly good tyres at an attractive price. Saying it 'generally starts on the button' is slightly perturbing, as it inclines the reader to worry about the times that it generally doesn't start on the button, these times generally being the most annoying times. The vulnerable siting of the wiring loom on W124 sixes could have something to do with it, but whatever the cause of the flaw might be, it's almost bound to be fixable. That's the beauty of a traditional Merc. And this is a beautiful traditional Merc. 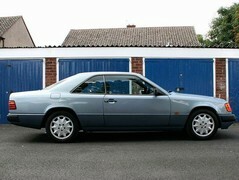 My Mercedes-Benz 300CE was bought to conduct a couple of classic car driving events in. Events done, with honours, it's sat in the garage for the winter but now has a fresh MOT on it and is now up for sale. They weren't concours classic events. It does suffer from the familiar W124 wing rot. 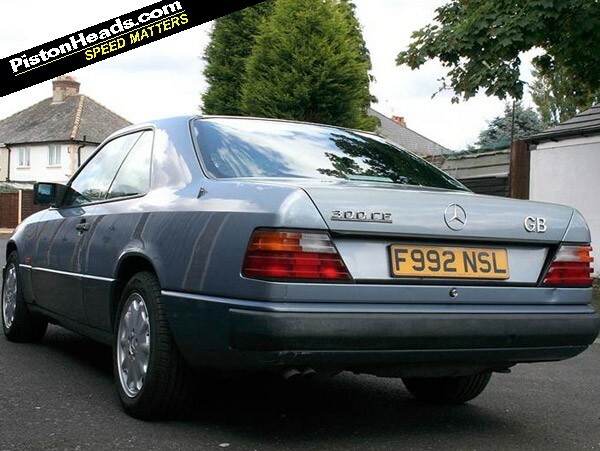 The worst is the nearside, which is why it comes with a new, unpainted wing in the boot. I haven't had chance to sort it myself. The driver's side is bubbling on the leading edge but looks far better. The paint on the bonnet isn't in a great state, and has been curiously sanded away and patched in the middle. The boot paint is faded too, but may be revived with some canny clay bar effort. It has some metallic clearcoat peel in places, mainly near the top of the pillars. There are a few age-related dings elsewhere but I must say, it does look pretty good for its age. Same inside; there's a hole on the driver's seat and some cracking in the middle of the dash but, apart from this, it's solid and doesn't look too tired. Even things like the sunroof and four pillarless electric windows, seatbelt helper arms and 'auto-fold' rear head restraints work. It has a fresh set of Falkens, which have done around 1000 miles and thus have loads of life left in them. Oh, and it drives nicely, with a lovely engine. Good oil pressure, watch-like smoothness and, courtesy of a new battery, it generally starts on the button. Take a good look at the images and do drop me a line with any questions you may have. It was in a burgundy red, with a cream interior. And to me it exuded style. Nice, more than worth a punt. Very good looking cars, if only they had a modern interior. I can just imagine that thing squeaking away and driving me to suicide! M-B's unique zebrawood that grows to attention in order to rule out knots. Nice line. Not unique outside of the world of cars though, e.g. Prada used it extensively in their New York flagship store. Have you ever been in one?! My recently sold '94 320 Coupe didn't have a single rattle or squeak after 140k miles.